Again, these (together with the previous lists), are placed without regard to order - at all. Here's the list! Every fantasy reader knows George R.R. Martin (although not often literally! 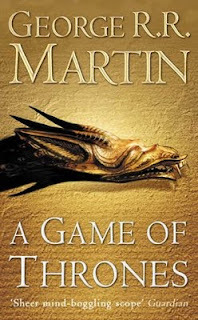 ), and for good reason: A Song of Ice and Fire is the premier political fantasy in SFF. Intrigue, a huge selection of viewpoint characters, and selective use of a "soft" magic system combine to make A Game of Thrones one of the century's essential reads. Be warned, though - Martin is brutal. Be prepared for your favourite character to suffer the consequences of his/her actions, as Martin's writing displays a ruthlessness that few have matched. It's cruel, and it's also fantastic. Martin is one of the writers to watch. Recently in development of a television adaptation, A Game of Thrones is more popular than ever: check out westeros.org or Winter Is Coming for the latest news on Martin's fantastic series. Another historical fantasy on my list, and one of fantasy's few stand-alone novels, Jonathan Strange tells a strangely inverted tale of English magic in the Napoleonic wars - but the simple description doesn't suffice. Eye-catching, entrancing, and fascinating, the factual and antiquated style of Jonathan Strange evokes an amusing pseudo-historical atmosphere - but with a twist. History is different. England possessed magic, once - in the distant past -, but now "magicians" are scholars with a respectable pedigree. The question of whether magic still exists has become rather unfashionable, in fact - until two scholars asking this very question uncover Mr. Norrell, a fussy, antiquated man - and a magician. Revealing a history of magic throughout, and after the Napoleonic Wars, Susanna Clarke's entertaining footnotes, antiquarian - and thoroughly amusing - characters, and above all, sense of sheer fun (adding zest to even the grimmest of passages), Clarke's debut is a must-read. I have heard of George RR Martin, however I have not read any of his books. I have considered picking up The Song of Ice and Fire. But I have not done so. You don't hear much about them anymore and I just wasn't sure as to if I would like them. Well, the picture you paint, I think I just might. I have heard the name Susanna Clarke but I haven't seen her books. I am going to have to look for this one I like the sounds of it as well. Is this a series or a stand alone book? I'd certainly recommend them! The fifth book has been much delayed (which explains the lack of hype), but they're still well worth reading. They are on my list now, too. Wow, 1000 pages. Number of pages doesn't matter as long as the reading is good and interesting the whole way through. This looks like a great blog. 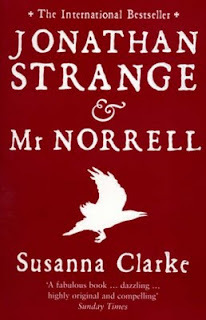 I love GRRM's ASOIAF series, and Jonathan Strange & Mr Norrell is a wonderful book (I recently reviewed it on my blog). Thanks for sharing.